A group of young Artists from Room 13 Lochyside took part in a short residency at the National Galleries of Scotland in June 2008. They returned to their own studio to share the inspiration they had collected, and together with their peers and colleagues around the world, spent 6 months developing work inspired by the work in the collection. 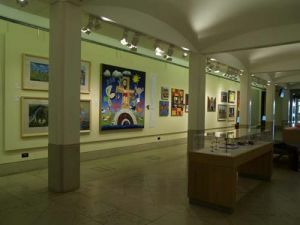 The resulting exhibition of artwork inspired by the National Galleries of Scotland, featuring work from Room 13 Lochyside and Room 13 International Studio Network, was displayed at the National Gallery of Scotland, Edinburgh, from 25th March to 29th April 2009. View photos of the residency and final exhibition on Flickr.